With its French chateau style architecture and Louis XVI furnishings, The Ritz London is a world famous London luxury hotel. Home to thousands of discerning guests since 1906, it continues to set the standard to this day. The world famous hotel offers old world glamour and wonderful service. The world famous Ritz London gets old world glamour just right and deserves its glittering reputation. 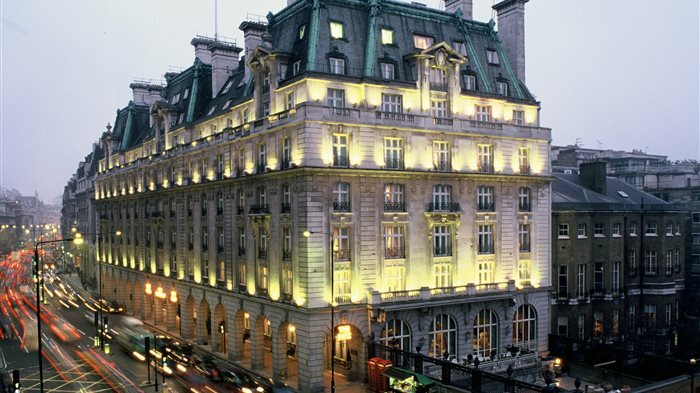 Right on Piccadilly with a roof terrace looking across Green Park, The Ritz London was conceived by renowned hotelier Cesar Ritz in 1906 and continues to innovate today. While the 134 guest rooms offer all the modern conveniences - free high-speed Wi-Fi, LCD TVs, en-suite marble-lined bathrooms - some traditions are upheld: a formal dress code applies in The Palm Court at The Ritz Restaurant where gentlemen must wear a jacket and tie. Jeans? Oh dear, no. The Ritz London has a long standing association with royalty and in 2002 it became the first hotel in the world to be awarded a Royal Warrant, given by HRH The Prince of Wales. The Ritz London rightly enjoys a reputation for style and wonderful service. Tea at The Ritz has to be the London equivalent of Breakfast at Tiffany's. Tea at The Ritz has to be the London equivalent of Breakfast at Tiffany's - a world-famous brand that captures the essence of each city's history and culture. Synonymous with the comfortable colonialism of the old British aristocracy, for Londoners afternoon tea at The Ritz conjures an image of luxury, indulgence, formality and impeccable service. Detailed in delicate shades of gold, pale green and pale pink, the Palm Court, where afternoon tea is served, is an exemplar of soothing sophistication combined with lavish Louis XVI luxury. Lofty ceilings, glittering chandeliers, gilded trellises, marble columns, deep cornices and draped floral curtains all combine for a visual treat of the old Establishment. Waiters, dressed immaculately in tails, serve up tea in fine bone china with exact precision while a pianist tinkles the ivories and a harpist plucks away in the background. Views of the Green Park royal gardens are a stunning reminder of a time when King Edward VII, Winston Churchill and Charles De Gaulle formed part of the regular stream or royal, aristocratic and noble visitors taking tea at the hotel's Palm Court. It hardly needs saying but dress smartly - a jacket and tie are essential for men. Early booking (as far in advance as six weeks for weekend sittings) is essential. A lesson in unadulterated opulence. A meal at The Ritz Restaurant at the grand Ritz Hotel, or at any of the Ritz restaurants for that matter, is seen as the epitome of British high society living. A lesson in unadulterated opulence, the dining room features towering marble columns, soaring floor to ceiling windows, vast kaleidoscopic ceiling frescoes, gilded neoclassical statues and a spectacular garland chandelier. The style of cooking follows the 'palace style' popularised by influential French chef Auguste Escoffier, "practically the patron saint of chefs" (The Telegraph), who invented famous dishes including peach Melba and bombe Nero at the Ritz's restaurant. Today's dining room also has a lovely outdoor terrace, the perfect spot to while away your afternoon in stately, wrought iron chairs in front of elegant tables laden with crisp white tablecloths and gleaming tableware when the heat starts to soar. The hotel and its restaurants are endorsed by His Royal Highness the Prince of Wales, and regular guests include politicians, film stars, members of the English aristocracy and American tycoons. Dress code: jacket and tie. Jeans are not permitted in The Ritz Restaurant and trainers and sportswear are not acceptable attire in any public area of the hotel. Brilliant bartenders, expertly craft cocktails and a soft soundtrack of jazz. The Rivoli Bar, an intimate cocktail lounge within the famous Ritz Hotel, re-opened in 2001 after a closure of some twenty years with interiors stylishly updated from their original early Art Deco look into the current more luxurious style of the late 1920s. Likened by Tatler magazine to a "gorgeous little jewel box", the award-winning Rivoli Bar drips with Murano glass chandeliers suspended from gilded ceiling domes, and is encased by wood veneer walls decorated with delicate Lalique glass insets originally made for the Orient Express trains. The cocktail list includes one Sir Charlie - a mix of whisky, absinthe and Champagne - named after Charlie Chaplin, a regular at The Ritz. The Rivoli Bar was, most memorably, the place where American actress Tallulah Bankhead sipped champagne from her slipper during a press conference to celebrate her arrival in London back in 1951 - and so created another chapter in Ritz history. Pampering and hair styling seven stories above street level. e Rivoli Bar to complete your day. From cheap budget places to stay to luxury 5 star hotels see our special offers for hotels, including The Waldorf Hilton Hotel London from 44% off.